For the all-time Top 100 players list that aired in 2010, see The Top 100: NFL's Greatest Players. The NFL Top 100 is an annual list that features the top one hundred players in the National Football League (NFL), as chosen by fellow NFL players. The rankings are based on an off-season poll organized by the NFL, whereby players vote on their peers based on the performance of the previous season. In the six-year history of the countdown, no player has been voted #1 multiple times. Also, only players that would be active in the next season would be eligible for consideration. NFL Network released ten episodes, each revealing ten players on the list during the 2011 offseason. The first episode, revealing the players ranked #100 through #91 was aired on April 30, 2011. The list's top 10 players were revealed when the tenth episode of the 2011 list was aired on July 3, 2011. The list, and series, began with the #100 ranked player, Washington Redskins quarterback, Donovan McNabb and ended when New England Patriots quarterback and 2010 NFL MVP Tom Brady was selected as the number one ranked player. The NFL Top 100 list returned for the 2012 NFL season. The season ran from April 28 to June 27, 2012. The list began with Tennessee Titans running back, Chris Johnson, and concluded the reveal of the number one ranked player, and the 2011 MVP, Green Bay Packers quarterback, Aaron Rodgers. Each episode of the season was followed up by NFL Top 100 Reaction Show, which featured NFL Network analysts reacting and voicing their opinions on the ten most recent players revealed on the list. The NFL Top 100 list returned for the 2013 NFL season. The season ran from April 27 to June 27, 2013. The list began with Baltimore Ravens tight end Dennis Pitta. 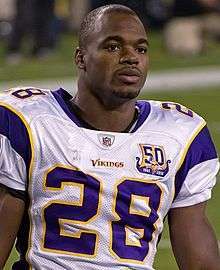 The number one ranked player of 2013 was Adrian Peterson, the 2012 MVP. The NFL Top 100 list returned for the 2014 NFL season. The season ran from May 10 to July 9, 2014. The number one ranked player of 2014 was Denver Broncos quarterback Peyton Manning. The NFL Top 100 list returned for the 2015 NFL season. The season ran from May 6 to July 8, 2015. The number one ranked player of 2015 was Houston Texans defensive end J.J. Watt. It marked the first year a defensive player ranked #1. It was also the first time the #1 ranked player was not the reigning MVP of the league. The NFL Top 100 list returned for the 2016 NFL season. The season ran from on May 4 to July 6, 2016. 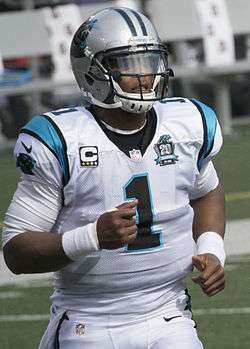 The number one ranked player of 2016 was Carolina Panthers quarterback Cam Newton. Marcell Dareus and Steve Smith fell out of Top 100, but were in honorable mentions list alongside Jameis Winston. ↑ Where Would Manning, Megatron & Other Retirees Be on the Top 100 Players of 2016? ↑ "Top 100: Donovan McNabb". National Football League. April 27, 2011. Retrieved May 10, 2013. ↑ Aashish Sharma (July 4, 2011). "Tom Brady Named NFL's Top Player of 2011: Why He Will Go Down as the Greatest". Bleacher Report. Retrieved May 10, 2013. ↑ Michael David Smith (April 29, 2012). "Chris Johnson falls 87 spots in NFL Top 100 ranking". Pro Football Talk. NBC Sports. Retrieved May 10, 2013. ↑ Network Ranking (June 27, 2012). 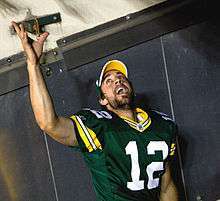 "'The Top 100: Players of 2012': Aaron Rodgers". National Football League. Retrieved May 10, 2013. ↑ "Top 100 reaction: Biggest surprise". National Football League. April 28, 2012. Retrieved May 10, 2013. ↑ Sara Bibel (April 19, 2013). "NFL Network Presents 'The Top 100 Players of 2013'". TV by the Numbers. Zap 2 it. Retrieved May 10, 2013. ↑ Aaron Wilson (April 29, 2013). "Dennis Pitta Named NFL's 100th-best player". Ravens Insider. Baltimore Sun. Retrieved May 10, 2013.